Discovered by the assistant professor of Ahi Evran University's Faculty of Science and Literature, Mahmut Erbey, a new insect that's snout resembles a dagger and causes decay on trees and plants has been registered with the name "Evrani ", ascribing to the name of the University. 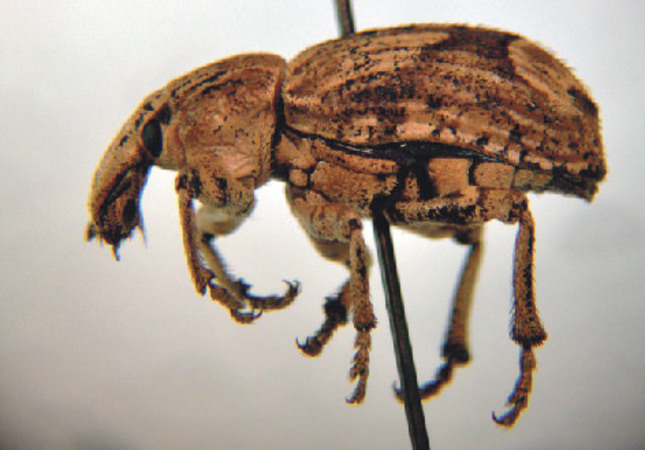 The insect belongs to "Rhytideres" strain of the "curculionidae (coleoptera)" family, founded by Erbey in the university's Bağbaşı Campus. The study on the new species has been published in the peer-reviewed international magazine, "Zoology in the Middle East," thus the registration process has been completed. Evrani drills and penetrates into plants and trees with its improved mouth structure and snout. It drops about 300-500 eggs inside the plants in just one go. When the insects are born, they decompose the structure of plants by eating them for sustenance. Thus, the trees and plants defoliate.